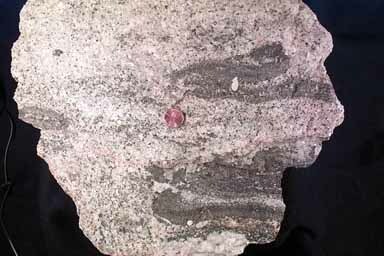 Migmatite - a high grade Barrovian metamorphic rock that has begin to fractionally melt. In appearance it looks like a gneiss intermixed with patches and splotches of phaneritic (coarse grained) igneous texture. This texture can be seen in the picture. 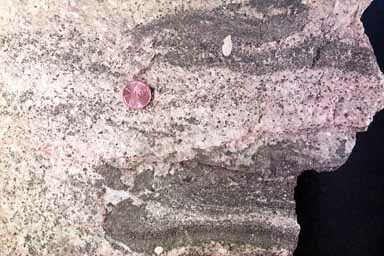 The dark splotches have gneissic texture, and even in the light colored areas the faint remnants of mineral banding can still be seen in places. When we talk of fractional melting of an igneous rock this is what the rock is like with part of the original texture remaining, but surrounded by a slush of melt. Of course, the heating process could continue and the rock melt completely to form a magma.